Cylinder – a unique series of vases from Kristina Stark’s new brand Stark. which is a part of Design: Kristina Stark. In 2018, the Swedish designer Kristina Stark turns 25 years as a designer and 10 years as a producer. In connection with this, Kristina launches her new brand Stark. where focus will be on products and objects in smaller series – sometimes even unique objects. 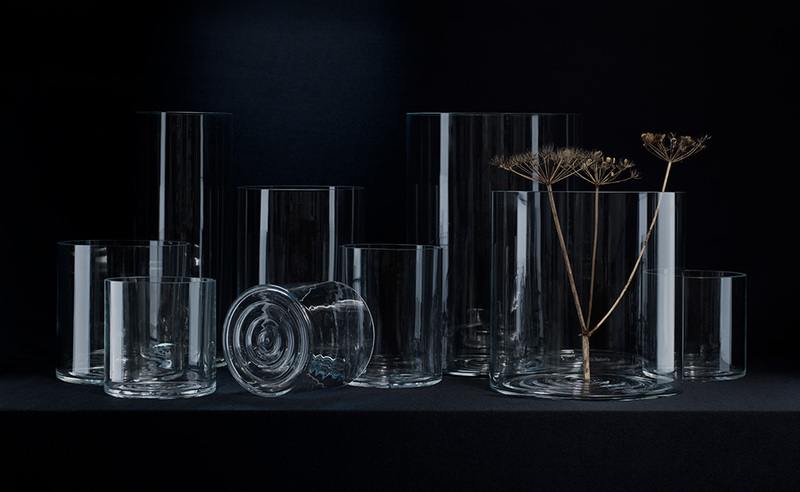 First out is the Collection Cylinder – a series of mouth-blown vases made at Bergdala glassworks in Småland. In the brand Stark. Kristina wants to give herself a bigger freedom as a designer. As an industrial designer, she often works in many different materials and sees no limitations. The series Cylinder consists of a unique collection of cylindrical vases. To this subtle simplicity Kristina has added a small detail containing a number of three-dimensional rings at the base which are meant to support both solitary stems as well as entire bouquets creating stable and beautiful flower arrangements. In addition to this functional detail, the rings also add a poetic expression as they create a reflection on the water in a similar way as when you throw a stone into still water. -The simpler shapes you work with, the greater the requirements for the best quality in materials and crafts. In the purest simplicity there is nothing to hide behind, Kristina says. The vases are mouthblown at the Swedish glassworks Bergdala. Someone has said that her language of design is rooted in Scandinavia. 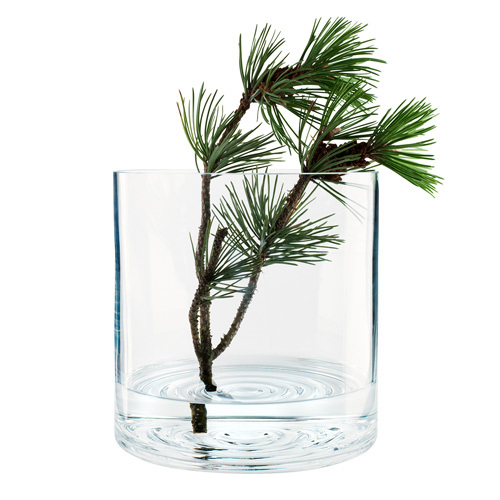 That her products represent the marriage of Nordic Culture and tradition with today´s demands for function and form. That she expresses herself in designs that are meticulous in terms of their form and aesthetically pure. Simplicity personified. The result is objects for everyday life. Things to be used. Made to last. Kristina says: “What motivates me is the desire to create ordinary things for everyday life and situations, things that people need to use regularly and enjoy using. Things intended to be used time and time again. Things that retain their attraction and appeal year after year. I enjoy solving the challenge of how to combine two different kind of forms. The same applies to the urge that arises to take away a line here or there and then to realise how that process of simplification has actually added something essential to the whole. For me, happiness can be the sound of a cup being placed on a saucer. Or the feeling of perfect balance when I hold a carafe and hear how the water ripples as I pour it into a glass. The surface of the glaze on a piece of porcelain can inspire a similar sensation within me , as can the way it reflects the light. Her studio and the two brands she runs reflect the uncompromising attitude to quality and the small-scale approach that are the hallmarks of all that she does. The strength of will behind her individualism makes itself apparent in many ways. As if designing products is not enough in itself, she also maintains full control over the production phase. She makes it her business to do so – in both senses of the word.